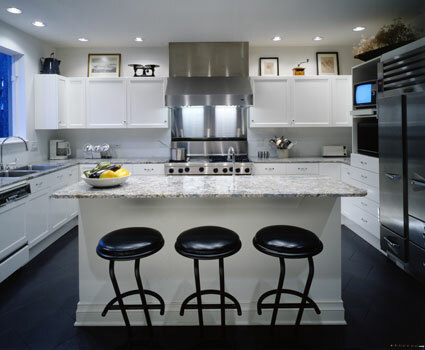 Kitchens - The Portfolio Group, Inc. Kitchen areas have become the “hub of the home” and therefore a critical element of space planning. Guests gather to socialize, and informal family meals need to be accommodated. In the trend for an informal lifestyle, especially in Colorado, the kitchen areas are open to the architectural features of the great rooms and views beyond. Still, there are practical considerations to be addressed: preparing and cooking food, cleanup, storage/pantry, hood-venting, lighting, computer station, etc. Also, of course, are the issues of how to place these elements in an aethetically pleasing manner. Below are some examples of how we have addressed the above issues. Bluff Lodge. This expansive kitchen has room for a breakfast nook with windows on two sides (in the background) along with two islands. The island pictured is for food prep and cleanup; the second (not pictured) is for informal “bar stool dining”, open to the great room behind. Other features include granite counters, a tucked-away Subzero refrigerator, Wolf appliances, and a hardwood floor continuous to the great room. The log-accented ceiling repeats the log detailing of the great room and second floor gallery. Rocky Mountain Arts & Crafts. The rustic flavor of the adjacent dining room and great room (see Interior Details) is carried through in the kitchen: “cabin style” planked cabinets, Colorado buffstone counters, beamed-ceilling, and vintage light fixtures. The project was featured as "A Home to Remember" in Mountain Living magazine. 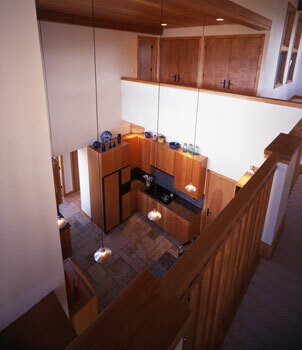 Here, the double-height kitchen at Castle on the Rocks is viewed from the gallery above. Highlights of this kitchen are the stunning multi-colored Colorado buffstone floor, clear vertical grain (CVG) Douglas fir flat panel cabinets, and an array of pendant lights strategically placed to provide light for food prep and cleanup. This home was featured in Colorado Homes & Lifestyles magazine. Green Bay Road. The glass circulation spine pictured here incorporates a slick breakfast area adjacent to the white kitchen with absolute black granite counters. The gallery captures views of an adjacent pool area and Midwestern woods beyond. 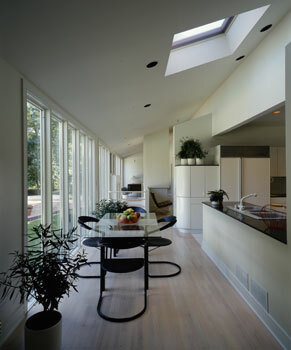 Other features include whitewashed maple floors, Subzero refrigerator, and Velux skylight. This project was featured as “Wide Open Spaces” in the Lake Forester (Chicago North Shore) magazine. 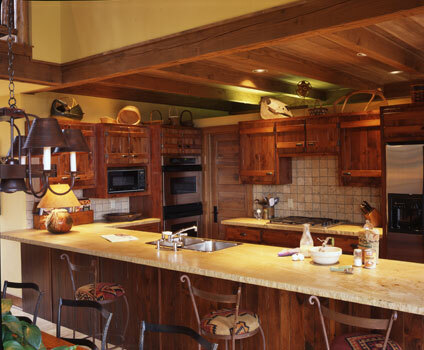 The double-height timber and truss ceiling at Aspen Valley Ranch also defines the kitchen and adjacent hearthroom. Highlights of these spaces are the reclaimed wide-planked oak floor and whimsical “flying saucer” light pendants above the island. This combination food prep and eating island features a two-tier granite counter arrangement which separate these functions. 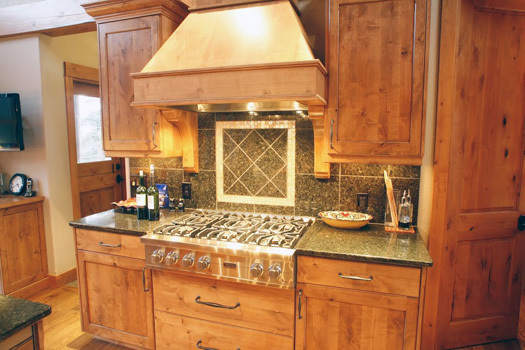 The cabinets are beaded Shaker-style in knotty alderwood, consistent with the overall rustic character of this mountain home. Aspen Valley Ranch. This thoughtfully constructed cooktop wall features a Wolf cooktop, a custom wood hood enclosure, and mosaic-tiled backsplash. 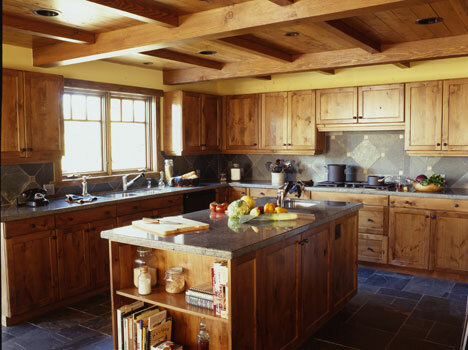 All are flanked by knotty alderwood cabinets and granite counters. Mountain Bungalow. 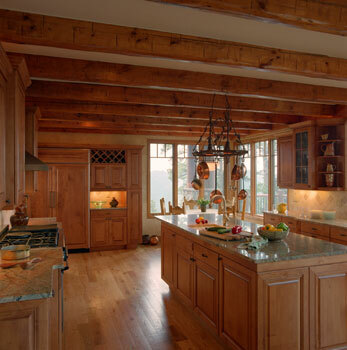 The expansive kitchen we designed for this home has room for two islands, all topped by a Douglas fir timbered ceiling. The island shown plays "triple duty" for food prep, buffet-style serving of appetizers, and cleanup. The second L-shaped island (not pictured) is for informal bar stool dining, open to the dining room and great room behind. 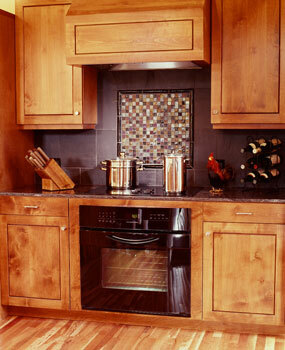 Other features include knotty alderwood cabinets, granite counters, slate floors, and continuous slate backsplashes. The project was featured on the cover of Mountain Living magazine’s Christmas edition. 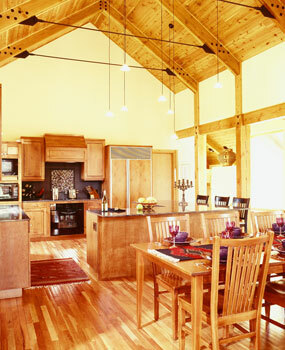 The timber & iron trussed ceiling at Twin Lambs Ranch provides a warm mountain canopy for this open kitchen, dining room, and great room arrangement. Highlights of the kitchen include an L-shaped island (which serves as both an eating bar and “staging area” for the dining room) and the unique array of light pendants above. 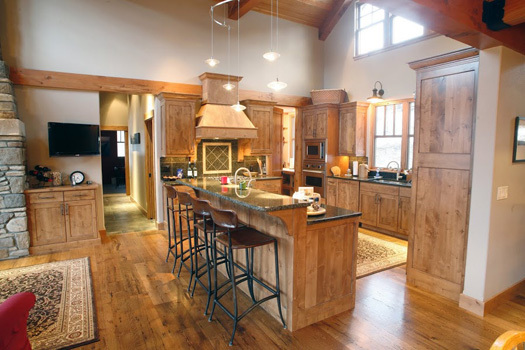 This project was featured as “Mountain Magic” in Log & Timber Style magazine. Twin Lambs Ranch. This carefully composed cooktop wall highlights the mosaic-tile backsplash, custom alderwood hood enclosure, alderwood cabinets, and granite counters. Ravine Forest. The meticulous composition of this kitchen features classic “North Shore Chicago” moulded Skaker cabinets, Franke sink, granite counters echoing the colors of the adjacent ravine, and stainless steel Viking refrigerator, stove, and hood. Return to Interior Design & Remodeling page.